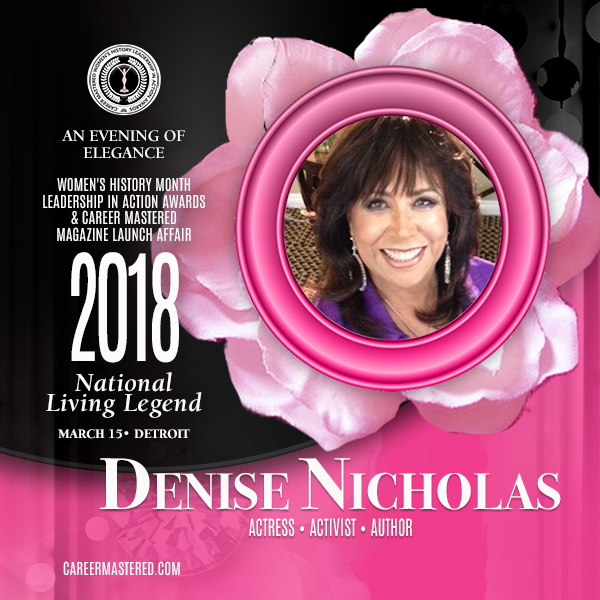 DETROIT, February 1, 2018 (Newswire.com) – Legendary Actress Denise Nicholas has been named Career Mastered National Living Legend for 2018. Nicholas will be honored during the Annual Women’s History Month Leadership in Action Awards Charity on Thursday, March 15, 2018, Roostertail Waterfront Entertainment Complex in Detroit, Michigan. The Awards Evening of Elegance is the highlight of Michigan’s Women’s History Month calendar, routinely attracting a sellout crowd. Denise Nicholas is an American actress, author and social activist who was involved in the Civil Rights Movement. She is known primarily for her role as high-school guidance counselor Liz McIntyre on the ABC comedy-drama series “Room 222″, and for her role as Councilwoman Harriet DeLong on the NBC/CBS drama series “In the Heat of the Night“. In addition to Nicholas, Leadership in Action Awards will be presented to amazing women leaders in the following cities: Charlotte, North Carolina on March 6; Detroit, Michigan on March 15, and New York City on March 24. The complete list of the Class of 2018 is available at www.careermastered.com. Linwick & Associates, LLC in conjunction with its sponsors will honor the achievements of women who have made a compelling mark in business. Honorees represent powerful women across diverse industries and disciplines. These women leaders are game changers who have mastered their work and have learned the necessary steps to move ahead and build successful careers. The honorees are exceptionally strong role models of what a woman can do. We’re thrilled to honor Denise Nicholas for the compelling mark she has made to shape America and women’s history while inspiring future generations. The Career Mastered Awards is the leading Women’s History Month Awards in Michigan honoring today’s women leaders who are Game Changers and take charge of their careers and their futures. The Award honors amazing women who have made a compelling mark on business and are exceptionally strong role models of what a woman can do. Established and presented in 2015 by Linwick & Associates, LLC. Career Mastered Awards celebrates and acknowledges the victories, challenges, and stories of the women who have helped to make our country what it is today. Proceeds from this program are donated to Excel Village, a non-profit organization whose mission is to provide youth mentoring and scholarships. Sponsors include Ally Financial, Northwestern Mutual, State Farm, Worth Financial, Oakland University, Fifth Third Bank, Beasley Media Group V101.9 FM, WCNC-TV, Comcast, Primax Properties. Linwick & Associates, LLC is a global human resources consulting firm with offices in Metropolitan Detroit and Charlotte, NC. The mission of the company is to create organizational value through people. Its Founder, Dr. Lisa J. Wicker is internationally recognized as a leader in human resources management with more than 30 years’ experience in organizational dynamics and change management across Fortune 500 Companies and Industries. She has been recognized by the Detroit News as one of the most successful women in Detroit. Corp! Magazine recognized her as top Diversity Leader in Michigan, Black Enterprise recognized her as a leading Diversity Champion in America, Jet Magazine recognized her trailblazing success, The Michigan Chronicle dubbed her a Trailblazer and UPTOWN Professional Magazine named her one of America’s top executives.